How tempting this looks to me, the colors so luscious and lustrous. I wanted to pick up the spools and feel them. Unfortunately, they were on the other side of the glass, as part of a display in the Fashion Museum in Bath, England. These days, embroidery is merely a relaxing hobby for many people. But before about 1920, it was an essential skill. 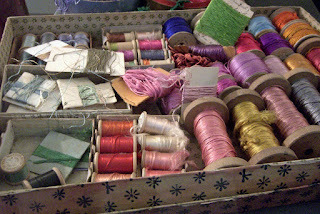 Women of modest means had to sew and darn. In wealthier families "fancywork" embroidery was a desirable accomplishment. For women whose lives were so constrained in other ways, it offered a certain amount of creative freedom. 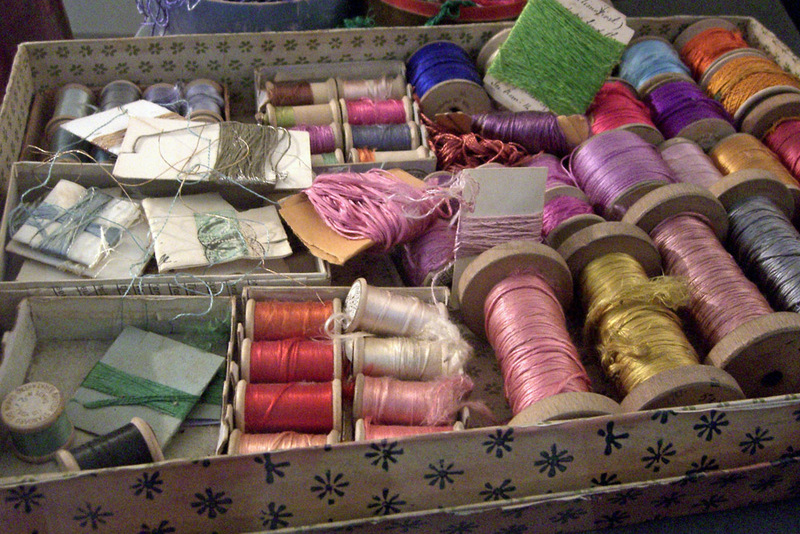 Do not underestimate the skill it takes to work with softly-spun silks like the ones in these boxes. Most of us who consider ourselves to be fairly advanced in our skills today would have great difficulty dealing with them. "Womens' Work," indeed.